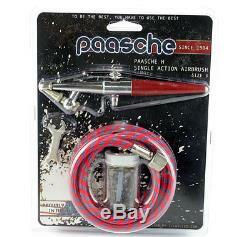 Paasche H-CARD Airbrush Basic Set Size 3. Brand New in Factory Packaging. In Stock Ships Within 24hrs. This is Paasche's H (Size 3) Airbrush Set in Carded Packaging. Siphon feed Single action External mix. Dependable and adaptable for practically any hobby use! Suitable for both right and left handed users. Machined brass body and nickel silver color parts, simplicity of design and ease in operation. The 3B Pressure Tank Valve is used in conjunction with the Paasche No. Air Propellant cans to control the air volume from the can to the airbrush. The HP-1/8 Plastic Air Hose is a PVC air hose that is lightweight and flexible. It connects your airbrush to a compressor. Operating instructions provided on package. 6' (1.83m) airhose with coupling. HC-3 Aircap (for medium fluids). Please note: I will not put less amount on custom papers, so please don't ask. You can return any item in Brand New/unopened condition (within 14 days). Please request for an invoice. The item "Paasche H-CARD Airbrush Basic Set Size 3" is in sale since Wednesday, March 19, 2014. This item is in the category "Crafts\Art Supplies\Airbrushing". The seller is "power_hobby" and is located in Mahwah, New Jersey.